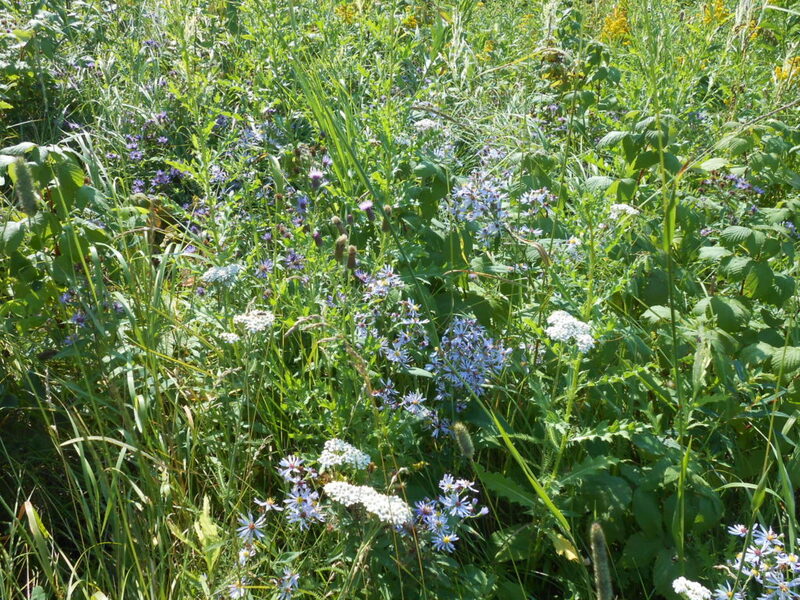 The Wood Bison Trail is on the south side of Highway 16. 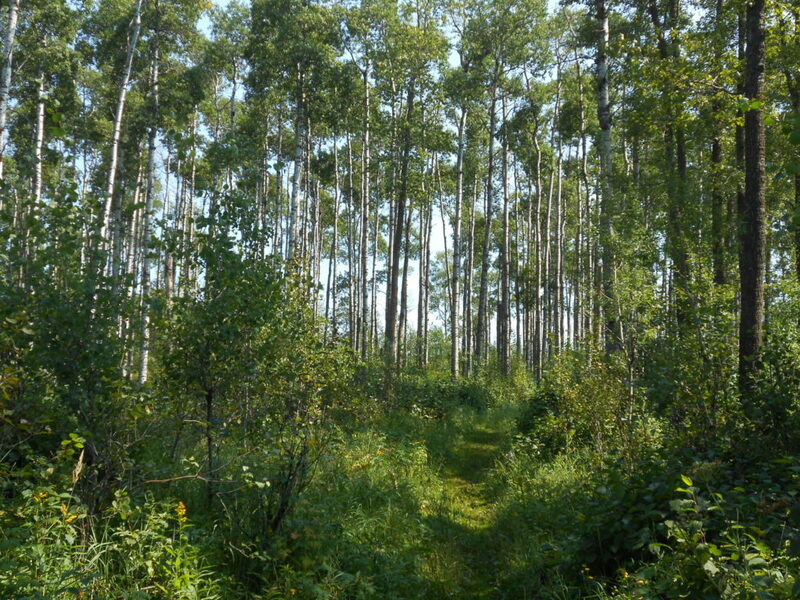 It is a beautiful trail that loops around Flyingshot Lake and Bailey Lakes where the Wood Bison are allowed to roam. These bison are kept separate from the Plains Bison found on the north side of the highway. The pictures from August 20th, 2017. Note that this trail is 16 km long. Be sure you are happy and able to walk for five hours not including breaks. Bring extra water (minimum of 3–4 litres) and food to keep your strength up. There are a few muddy sections, so wearing hiking shoes or light boots would be ideal. The length of the hike means that we will not return to the trailhead until about 4:15 p.m. nor to Edmonton’s Belvedere NE parking lot until about 5:00 p.m. There are washrooms at the trailhead and the trail is private enough to allow a “separation break.” We’ll hike the trail in a clockwise direction starting from the parking lot (so the few minor hills will be after lunch). Wood bison are the largest land animals in North America, weighing ~900 Kg (~1 ton). They are bigger than plains bison because they consume a lower quality diet that is composed of plants that are not easy to digest. The larger digestive tract allows the wood bison to get the most out of these poor food sources. Early May will cover the calving period so keep your eyes out for little red calves. Don’t be alarmed if the females look skinny and sickly, they are recovering from the winter and giving birth. The bison will also be shedding this time of year (contributing to their sickly appearances) – keep an eyes out for clumps of fur, sometimes they even shed in “mats” which can be 1-m long. The fur is very soft if you find some. Bison are classically thought of as grazers (eating just grasses and sedges), but during the spring they take advantage of the highly nutritious and easily digestible new growth on shrubs, trees, and herbs. So, if you see the bison pay attention to what they’re eating. This is the focus of Lee’s research, so if we see something interesting like bison eating rose buds, let him know! 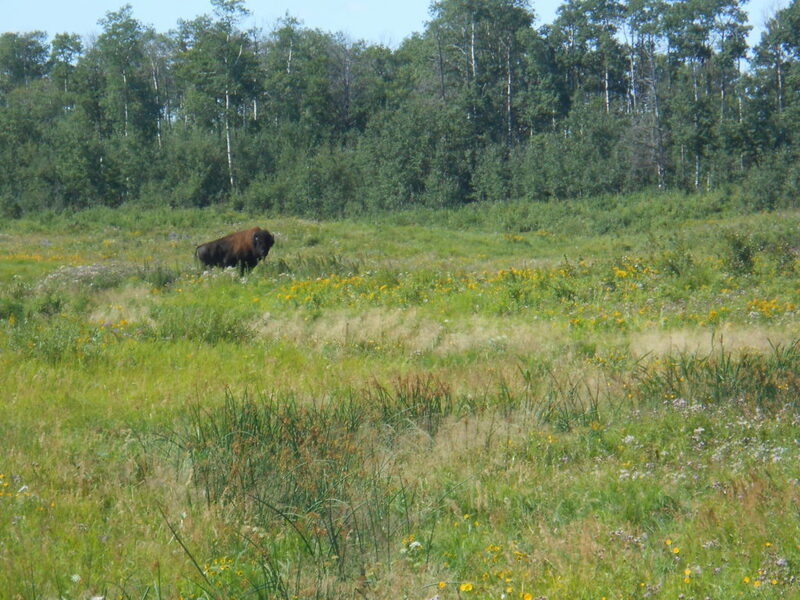 Elk Island represents the southern extent of the historic range of Wood Bison and the northern extent of the Plains bison range. So, this is an area where the two subspecies naturally co-existed. The difference arises from the bison eating fresh, wet plant material in the spring/summer but eat dead grasses and sedges in the winter. Dried bison dung paddies are great fire starters and smell amazing. Those of us coming from Edmonton will meet at the Belvedere ‘Park & Ride’ Pay lot (free on weekends) and carpool from there, leaving promptly at 9 a.m. Participants may choose instead to proceed on their own directly to the trailhead, but should check the website prior to departure in case of a change (e.g., weather forecast, trail conditions) and should arrive at the trailhead no later than 9:40 a.m. Here are directions to the trailhead: Take the Yellowhead (Highway 16) to the entrance for Elk Island National Park. However, don’t turn north into the park; instead turn south onto a little dirt road that is opposite the main entrance to the park. Follow this dirt road as it takes you west parallel to the Yellowhead for one hundred meters or so, and follow it as it bends south and then west to a parking lot. The trailhead for our Wood Bison Trail is there. So is an outhouse – make use of it while you can! Be sure to arrive at the trailhead no later than 9:40 a.m. You can plan your trip and travel time to the trailhead by starting with this Google Map, which gives the entrance to the dirt road off of Hwy 16 to the trailhead — just click on the Directions icon and type in the location of your starting point. If you are new to WTA hikes, then you should visit the Guided Hikes webpage for essential information. For further information specific to this hike, refer to The Waskahegan Trail Guide Book, pages 94-95, or contact the Hike Leader, JoAnne B & Lee S..
Watch out — it’s rutting season! Wonderful tree canopies with lots of sunlight filtering through.